I've been extremely pleased with my tags. My first order was for my dedicated companion and safely friend for fifteen years, who is now in Rainbow Bridge. This second order is for yet another Golden Retriever who I pray will be just as dedicated. The tags benefit not only myself but it eliminates so many questions from the public and private sector, just by the sight of it on my friend. These tags were certainly a dynamic invention, especially for Service Dogs and those Dogs escorting the blind. I found these tags in a search several years ago. This is my 3rd order of tags - they last a long time. This last time is the first time I've replaced them because of wear after several years of use. I've bought the large tags and the small ones. I used the small ones to label supplies - dog bag, a harness that fits with my SD's backpack, and the detachable backpack - attaching them with zip ties. The large ones I've used on his vest and on hot days his collar. Service is prompt, tags are high quality, and the price is reasonable. 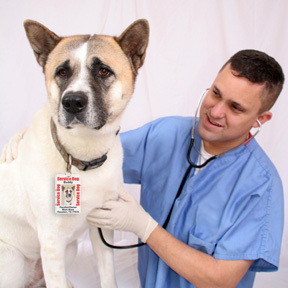 ServiceDogTags.com is the company I use and trust. I first bought these about a year after getting my first service dog. They are good quality and with the laws right on the back really make traveling and going out with a service animal much simpler as many people still don't understand service dog access rights. Now that my first service dog is retiring soon we ordered as set for my SDiT. We have not used them yet as she is still in training but have no doubt they will be as useful as her sisters were. The picture came out clear and it is very professionally made. I like that it comes in sets of two so one can hang on the vest and one can go in my wallet. I have used your service & products several times in the past three years. Your help most recently was the quickest & most efficient yet! Kudos y Bravo! I found these service dog tags some years ago and have used them ever since. Good tags, good company. These Have been so convenient. I really don't have to put his vest on in many cases. The picture and everything. Work just fine. I highly recommend this product, it saves a lot of hassles only problem is the everyone wants to pet Midnight, I have to explain he is a working dog. And he has to pay attention. Although some of the children I'll tell "ok, but only a little bit, because he won't get paid, he's working just like your Daddy or Mommy. Then The questions start, But they're kids I'm glad they ask. I am very pleased with the look and quality of my ServiceDogTags, though i was somewhat surprised by the cost. ServiceDogTags.com and I was very pleased when they arrived surprisingly fast. The quality of these tags is just great. I ordered the extra strong tags, because my dog is active. I also ordered the hologram for the wallet I.D. tag. It looks absolutely marvelous! I am very very happy! Thank you very very much, ServiceDogTags.com!! Click the button below to add the Service Dog Tag Set for Large Dogs (2 Lrg Tags) to your wish list.